Studio22 is very fortunate to be able to work with Susan Oomen and her peaceful oils. With us since 2012, Susan brings us this most beautiful body of work themed to encompass the simple notion of pause – something we don’t always get enough of in our daily routine. We believe art rallies us toward and provides our homes with that pause; a break, a breath, an interlude. Interludes is a stunning collection of artwork that you will want to hang in your own home. Put an Interlude on your wall and into your day to day. From the sunlit table with tea and flowers, signifying contemplation or intimate conversation, to the getaways on water, canoeing, sitting on water’s edge, these paintings share the same theme. They are about space and time away from the busyness of our lives. They are also about water, as it is a connecting element throughout my work, lakes, rivers, snow, mist, tea, or even water in vases. Stillness and peace, we all seek it, and it is becoming harder to find. So much of our lives are made up of noise, communication, moving from one task to another. Interludes become precious and necessary. Interludes are sometimes planned, as in vacation, time on the water in a boat, or just being on the dock or beach. But many of our interludes are unplanned. Some of the most precious and memorable come unexpectedly. A random event takes us away from the plans of the day, perhaps a simple unexpected wait, where we connect with strangers. Or a fender bender or power outage that leads to unexpected moments of thought or conversation. Your house without power changes as all the chores that involve electricity disappear and you end up sitting in a chair, watching rain or snow fall, in fading light. In these interludes we are taken out of our habits, our rigid thought patterns, and they become times of contemplation, perspective is clear and thoughts are random. Stillness is a gift and a necessity. My recent work involves images of water, of buildings that appear to float on water’s edge, sometimes briefly lit by afternoon light…..or canoeists in mist or sparkling water. The colours appear like jewels, the reflections falling, fracturing and disappearing into dark rippled water. There is also the mystery of the dark water, and what lies beneath, and what lies beyond the dark shadows of shoreline and bush. Sometimes the water is churning, sometimes like glass. Water has character, and is constantly changing. It is a continuous joy to observe the different moods of water, a joy and challenge to portray. It occurs to me that like children, who I believe depict things in illustrations to make them real, I too depict the things I want to make real for myself and others. These paintings allow me to be there in that moment, on those lakes and rivers, for that misty morning, away from my own routines, if only briefly, but enough to bring that short necessary interlude, that memory revisited. Susan was born in Smith Falls, Ontario to Dutch immigrant parents. She grew up on a farm in the Kingston area with her ten siblings. Developing an interest in oil painting at a very young age lead her to attended Queens University and graduate with a degree in fine art in 1976. Presently she lives in Utopia, a community near Barrie Ontario, with her husband Derek. 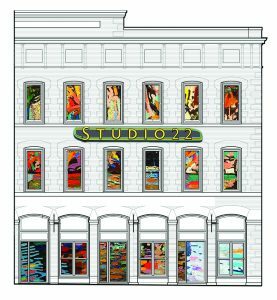 She is represented by Roberts Gallery in Toronto, Studio22 in Kingston and Rouge Gallery in Saskatoon. Her work can be found in numerous public and private collections throughout Canada and the United States.